I’ve never been to Vegas. And I’ve lived in LA for ten years. I don’t care about gambling at all, but I like the idea of winning my chicken dinner. I doubt they still do that, but I should go. I should at least check Vegas off my list. What I do love, a lot, is chicken. For quite a few years now I have been mastering my whole roast chicken. It’s sort of my Sunday ritual. 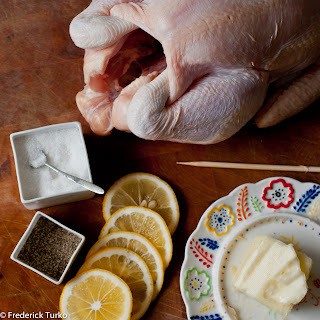 I get a chicken at the Sunday farmers’ market, or at Lindy Grundy, and roast it that night. In the past year, usually Maggie joins me as she’s generally around on Sunday nights. Fred has had one or two, I think. All of my peoples have had my roast chicken at some point or another. Like I said, I’ve been making it for years. What I love so much about the Sunday Roast Chicken is how it’s really a whole week of chicken joy. Yes, it is dinner on Sunday night. But then it is sliced in sandwiches on Monday, chicken salad or tacos on Tuesday, and chicken stock on Wednesday, used both for soup bases and in our dog’s food for a little yummy, protein kick that lasts for the rest of the week. All from one, small chicken. I’m not sure why, but unfortunately the chicken entrée is historically the pariah of the menu in most restaurants. It’s treated as the throw away, the cheapest option, the choice for the kids, the relative visiting from Iowa or the seniors at the table. I'm thinking about L.A. Story, the 1991 movie that Steve Martin wrote and starred in as Harris K. Telemacher. He attempts to land a reservation at an upscale L.A. French restaurant called L' Idiot (pronounced Leedy-O), only to be interrogated about his finances by the Fourth Reich Bank of Hamburg. "He can't have zee duck!..." the chef snorts. "He can have zee chicken." There have always been exceptions, of course. 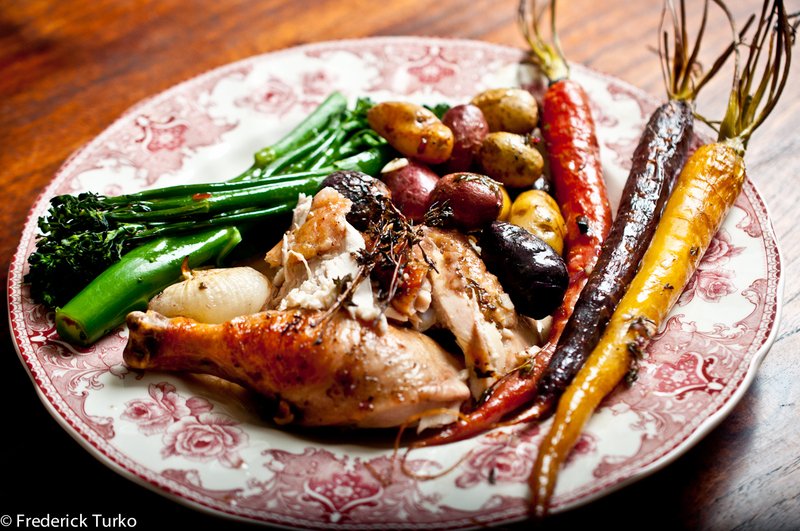 Both Zuni Café's Judy Rodgers and French Laundry's Thomas Keller both have very famous roast chickens that are the stars of the menu. And lately, times they are a changing. Suzanne Goin has a Devil’s Chicken with Mustard and Bread Crumbs that blows my mind. 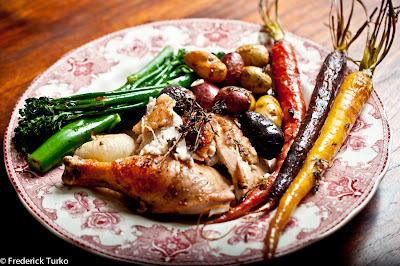 Salt’s Cure often offers a half roasted chicken that is pretty tasty as well. But, to be shamelessly, brutally honest – I think mine is better. And the majority of the people that have had my roast chicken will agree. On the night that I actually roast the chicken, something magical happens in the house. Regardless of the weather or time of year, it might as well be blustery and chilly outside and inside the whole house is warm and welcoming and smells like home. It feels like flannel and fireplace and jazz. Although, I am ready for summer in a big way, I cannot control whatever it is that is going on with our weather here right now (or ever, for that matter). And ever since Fred and I returned from San Francisco last week where we finally sampled the Zuni Café chicken, my wheels have been spinning. And so how fortuitous that we have had a cold, blustery, rainy weekend? And so last night, on a rainy St. Patrick’s Day, Fred and I built a fire, put the Pogues on the radio, and got to roasting a chicken – slow and low, that is the tempo. While that chicken cooked, we snacked on white anchovies, cheese, olives, soppressata, marcona almonds and bread. I also worked on a stock from the chicken feet. 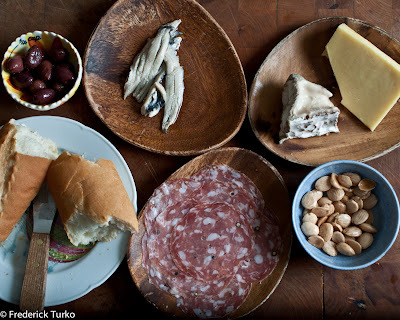 Then when it was all ready, and the house smelled like cozy, Fred and I sat down, poured ourselves a couple of glasses of garnacha and ate until we were sated. Heck, we even whipped up some sauteed broccoli rabe topped with a beurre blanc to add some green in the spirit of St. Patrick's Day (we are nothing if not festive). We saved the other half of the meal for Maggie to have when she returned home from working a double. And with the week ahead I look forward to all of the other dishes we create from that one little chicken. I'm going to shoot for a pasta tomorrow, I think. Or maybe Maggie can whip up some of her infamously spicy chicken lettuce wraps. Who knows, the possibilities are endless. Now, who’s up for Vegas? Rinse the chicken well (inside and out) and pat it dry with paper towels. Tuck the wings up against the breast. Poke tiny holes through the skin, everywhere with a toothpick or bbq skewer (this helps achieve super crispy skin). Season 6 Tablespoons butter with 1 tsp fresh thyme leaves, salt & pepper and mix together. Carefully slide your hand underneath the chicken skin, and move over the breast and leg meat to create a gap between the skin and the meat. Try to keep your hand as flat as possible and work slowly so as not to tear the skin. Evenly smear the butter beneath the skin. Next, take 6 lemon slices and slide them underneath the skin, giving them a slight squeeze, and again evenly distributing them on top of the breast and thigh meat. Take the remaining 2 tablespoons of butter, and gently rub it all over the outside skin of the chicken. Salt and pepper the outside of the chicken and inside the cavity. Drop 2 lemon slices, an onion, a bulb of garlic and any leftover herbs into the cavity, giving the slices a slight squeeze as you place them inside. Tie the ends of the drumsticks together with twine. Place the chicken breast up in the cast iron skillet. Distribute the carrots, potatoes and onion around the bird. Drizzle the red wine over the top of the whole thing. Top chicken with sprigs of thyme. Finally, squeeze the juice of the remaining lemon pieces all over the top of the chicken. Place skillet in the oven, with the chicken legs pointed to the back of the oven. After 30 minutes, lower the oven temperature to 350 degrees. Check on the chicken every fifteen minutes or so, and when you see it beginning to brown quickly on top, baste the chicken with the pan juices. Roast the chicken for an hour, basting several times. The chicken will be done when the juices run clear and when the leg joint can be easily moved if wiggled. A thermometer inserted into the thick part of the thigh should read 180 degrees. Oh... Opps, I don't think it will make it to Monday... Sure was Delish though! i want to try this chicken! 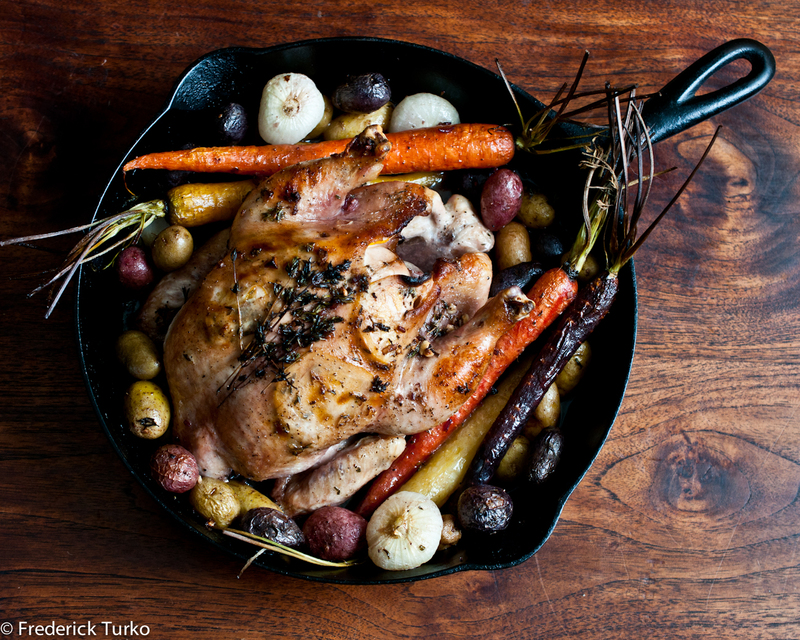 Simple roast chicken dinner... I can't think of anything more comforting. Oh, I want to try this. I just purchased a small organic chicken (2.07 lb.) from Gelsons. I am always looking for small portions since the family has downsized. Can I roast this chicken like yours, or is it too small? What do you think to roasting time should be? Usually the instructions tell you not to perforate the skin, but you say to poke holes in the skin. 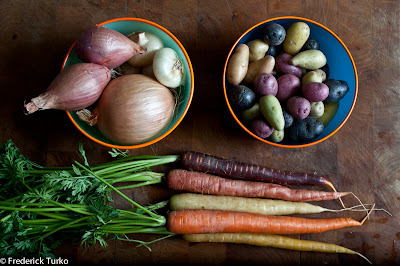 I am always looking for a browned skin and this may be THE RECIPE. I have some Thomas Keller preserved lemons that I am going to try. He says to slice instead of quarter so I think this would go well. I usually try to make exactly at least for the first time, but I am anxious to try my new preserved lemons. You can certainly roast your lil' bird the same way. I would simply cut the cooking times back a bit. Maybe gor for 20 minutes at 450 and then 45 minutes at 350. As long as your thermometer reads 180 degrees. I just wanted you to know I think this is probably the best meal I have ever cooked. The depth of flavor is over the top. You were correct on the roasting time. I can’t wait to fix this for my sister who I call a supertaster. She has the most sensitive taste buds of anyone I know. Is this your favorite meal, because if you know of one better please point me in that direction? Thanks for the extra help.